Considering that only recently, our own Pierre gave you the rundown on Tumblr, I figured it would be a fine time to step in and give you a look at Lightbox, a newly rolled out app for Android that gives you all the power of Tumblr but with a little easier experience. 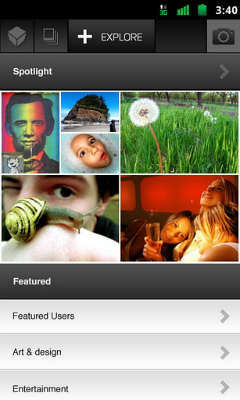 Lightbox offers its users many of the same features as Tumblr, like a blog-style experience to upload your photos. 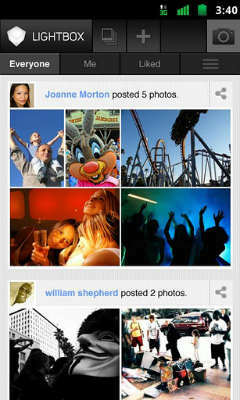 The photos you post, in turn, are automatically organized into a timeline. This timeline can then be shared with whomever you wish–you can either selectively allow only friends and family to see the timeline, or you can open it up to the entirety of the Lightbox community. Plus, photos taken in conjunction with the Lightbox app get automatically uploaded to Lightbox’s web site, which serves as safe, remote, offsite (really comparable to cloud computing) storage for them and ensures their safety, even if the unimaginable happens to render all your photos destroyed. The app is actually a significant alteration from the previous versions, including a new interface and new tabs for exploration within Lightbox itself, and Facebook and Twitter besides. And indeed, there’s plenty of opportunity here for small business to take advantage of this for their promotion. If you deal in products, then photos of your various product lines will slip in here nicely. Lean more toward services? Still valuable–after all, you can’t go wrong with showing a variety of satisfied clients. And on top of it all, you can take advantage of getting your pictures out onto the wider web, where you can set up a backline of contact measures–like your toll-free number or your virtual office–in place to make the all too necessary jump from web contact to direct face to face (or more appropriately person to person) contact. Admittedly, this isn’t so much a replacement for a blog as it is a potential alternative to use alongside it as part of a low-cost and easily accessible marketing mix. You’ll be able to use this as a quick and easy way to put up a whole lot of pictures, and if you’re light on the pictures, it won’t be so useful to you as other alternatives. But if you’ve got products–or satisfied customers–you want to put up front and center, then Lightbox may be just what you need. Mmmmm, good one, Steve ;-). Looks pretty awesome.